Charles Chocolates. It seems that everyone we know celebrates the Chinese New Year (lunar new year) with a Chinese banquet. *Chinese New Year begins according to the Chinese calendar, which consists of both Gregorian and lunar-solar calendar systems. Because the track of the new moon changes from year to year, Chinese New Year can begin anytime between late January and mid-February. If you only want one item, go for the rabbits. It is, after all, the rabbit’s year. 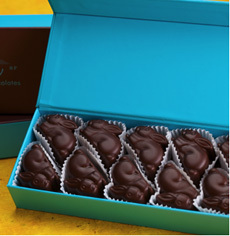 Purchase both boxes for $45.00 (a $5.00 savings) or the rabbits only for $20.00, at CharlesChocolates.com. We love to give gifts from Burdick Chocolate. The flavors are sophisticated and the wood boxes are keepers after the chocolate is gone. 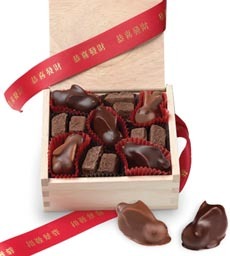 For Chinese New Year, the box is filled with five chocolate rabbits and eight honey and lemon pepper truffles. The milk chocolate rabbits are filled with a spicy almond ganache; the dark chocolate rabbits with tangerine ganache. The box is stamped with a gold “Good Luck” wax seal and tied with a red-and-gold ribbon imprinted with “Gung Hay Fat Choy” in Chinese characters (which means “wishing you great happiness and prosperity”). The box is $25.00 at BurdickChocolate.com. Celebrate with either or both. Just be sure to get your order in now so the rabbits arrive in time for the Year Of The Rabbit. Rabbits and truffles with elegant flavors.